The rumored Lexus LC-F is likely to come to market with a twin-turbo, 4.0-liter V8. It should look fantastic if the LC 500 is any indicator. It’s supposedly coming with 600 horsepower. It’ll probably do 0-60 in the low 3 seconds. It’ll be a faster, more expensive, more exclusive version of what I believe to be the best car on sale. I hope it never happens. I’m all for more performance cars and sports coupes as a general rule, but I genuinely believe you can’t improve the LC 500 with more speed and you certainly won’t improve it with a pair of turbochargers. Let it remain pure and unadulterated; leave the horsepower wars to the Germans. To show how an LC-F would be so fundamentally wrong, I have to first explain what made the current LC 500 so good. The beauty of the LC 500 is that it didn’t pursue the ridiculous performance chest-thumping that leads to cars too fast for their own good. You don’t need to go 0-60 in under three seconds, and you certainly can’t feel the difference between 2.8 and 2.9 seconds. The LC 500 is the car that understands that. It hits 60 in 4.4 seconds. That’s quick enough. It handles well, but Lexus doesn’t shout about track times. The LC 500 is what happens when you prioritize user experience over stats. If they wanted more speed, they would have gone turbo. But the LC 500 is powered by a glorious naturally-aspirated 5.0-liter V8 that screams through its ten gears. Sure, you don’t get the massive power band of a modern turbo motor. But the result of that decision is an engine that sounds fantastic and loves to be revved out. And with ten gears on tap, it’s always firing off shifts and making lovely pops and crackles. There’s no way to add power without giving that up. You either need to add turbos or make the engine bigger, and it’s safe to assume Lexus hasn’t been hiding a 7.0-liter V8 in its basement. Plus, in a weekend of running it to redline at every opportunity, I was happy to be able to hear it roar without crossing into the lose-your-license portion of the speedometer. So you can’t add power without making it worse. But “lightness,” my fellow Jalops may cry, “add lightness!” A good refrain, in theory, but I’m not confident you could really do that. 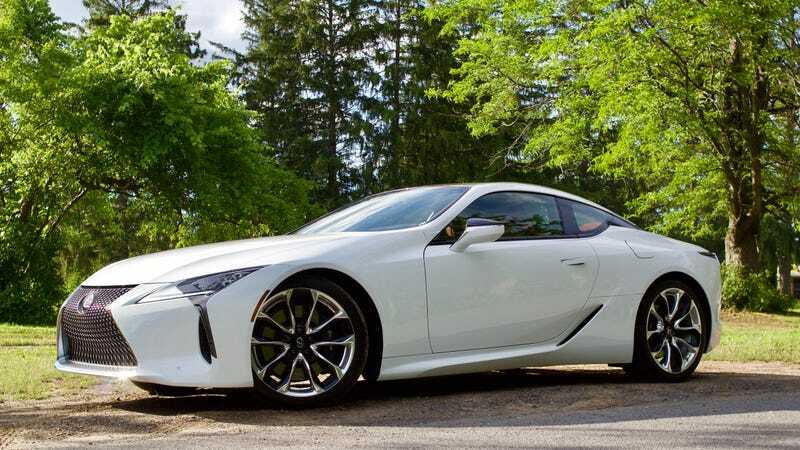 Because Lexus was also smart about what they put in the LC 500. The first big, heavy thing is the Mark Levinson audio system. Seems like an obvious thing to cut, but it’s one of my favorite things about the LC 500. It’s crystal clear even at absurd volumes, with even-toned sound that perfectly compliments the grand-touring mission of the LC 500. The seats are heated, cooled and most importantly fantastically comfortable. They aren’t overburdened with 30-way adjustments or massaging functions, so that’s reasonable too. I guess you could ditch the back seats, but the cargo shelf you replace them with wouldn’t save all that much weight. You could also replace the terrible infotainment system with something lighter and less terrible, but we’re talking a few pounds saved. To dramatically lighten the LC, you’d need to swap out a lot of the structure with lighter materials or ditch the insulation and sound deadening that makes this a fantastic highway cruiser. One option destroys the value proposition of the LC, as retooling the fundamental parts of the car would be fantastically expensive, and one makes it worse at its mission. It’s a terrible trap Lexus has laid for itself. The LC 500 is simply too good at its job to warrant a higher-performance model. Not only that, it’s so good it deserves to be the halo model of the Lexus lineup. To attempt to overthrow it with a car that’s needlessly powerful and less exciting would be foolish. If you want the LC 500 to be perfect, just fix the infotainment. That’s it. Job done. It’ll save you the millions in R&D it would cost to develop an LC-F and can be spread across all of Lexus-dom, where the biggest problem is an interface that makes you want to set yourself on fire. Could You Do $11,500 For This Supercharged 3.8 1988 Pontiac Fiero?